Breakfast was never my favourite meal and I often skipped it in my younger sillier days. Better sense has prevailed and now I cannot function without it. Leave me unfed in the morning and I am so crabby I can't stand myself! Making breakfast is the hubby's duty and usually he keeps things simple with toast and spread, porridge, cereal and milk, or fried eggs with toast and spread. While I do like eggs I don't like fried eggs. I do love omelettes, however, and once in a way he gets creative and whips up an interesting omelette for breakfast. The interesting element often depends on what's lying in the fridge and occasionally a simple but sumptuous creation arrives at the table. This morning it was a herbed chicken and cheese omelette. Beat the eggs nicely in a clean bowl. Season with salt and pepper. Heat your omelette pan and add a splash of olive oil. Once the oil is heated well pour in the beaten eggs. Let it just set and then arrange the shredded deboned chicken on one half of the omelette. Place the cheese slices on top. 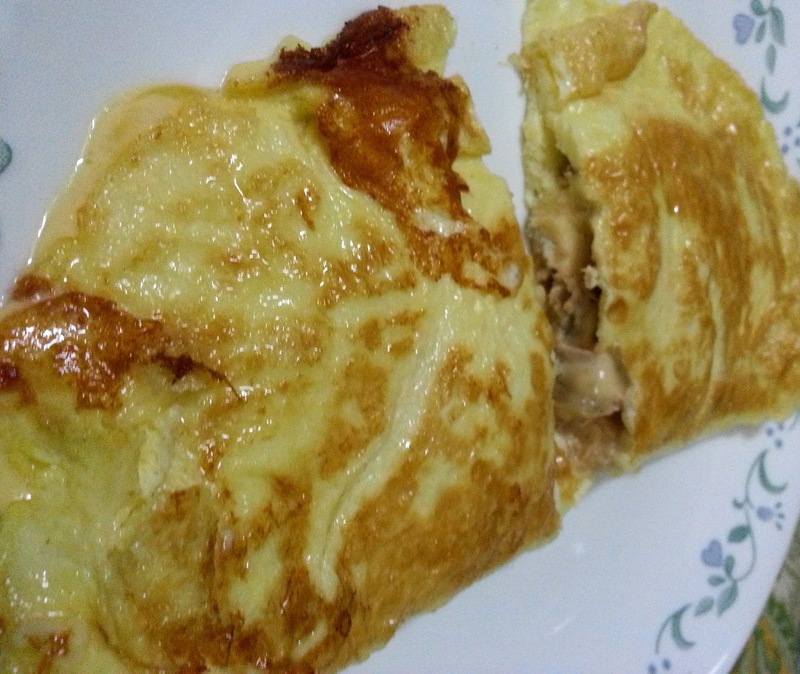 Fold over the the omelette to cover the filling. Cook the omelette till it is set to your preference. Remove to a plate and serve with hot toast, butter, jam and whatever else you like.